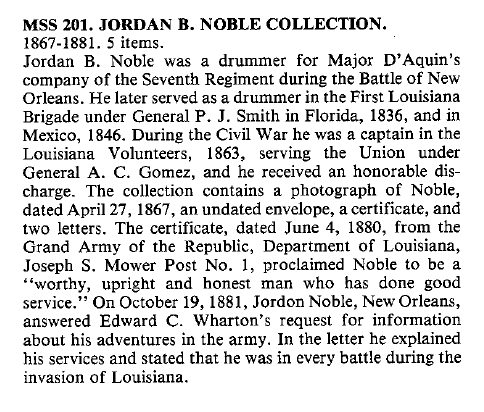 Jordan Noble was a free black drummer famous for beating the long roll at the Battle of New Orleans. 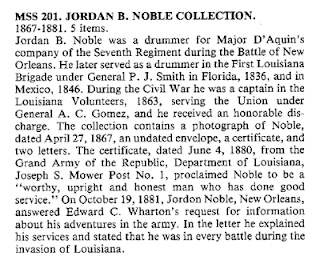 Born in 1800 in Georgia, Noble came to New Orleans in 1811 and joined the United States army one year later. He participated in several engagements of the Louisiana campaign. At the Battle of New Orleans, he opened with reveille. He later served as a drummer in the Mexican War of 1846-1848 and rallied New Orleans free men of color to form militia companies on behalf of the Confederacy at the outbreak of the Civil War. Jordan Noble used this drum later in his career. See also, "The Terrible and the Brave: The Battles for New Orleans, 1814-1815"
Free black men fought alongside regular U.S. troops, volunteers, and militia at New Orleans. Among the most famous of these was Jordan Noble. Though the inscription on this photograph associates him with Major Louis D’Aquin’s Battalion of Saint Domingue Free Men of Color, Noble actually served as a drummer boy for the 7th U.S. Infantry. Noble went on to fight in the Mexican War and the Civil War and played his drum at parades and civic events until his death in the late 1880s. 12" X 9 1/2" ~ PRINTED BY MOWER POST NO.1, DEPT OF LOUISIANA, GAR ~ JORDAN B. NOBLE, VET OF 1812, FLORIDA WAR 1846, MEXICAN WAR AND CAPT IN THE 7TH LA. 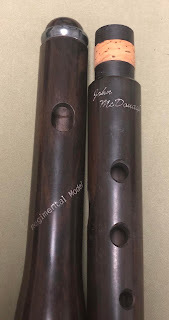 VOLS, UNION, RAISED FOR THE DEFENSE OF NEW ORLEANS IN 1863 ~ ASKS FOR MEMBERS TO SUPPORT THE OLD VETERAN AS HE SUPPORTS HIMSELF PLAYING MUSIC AS ENTERTAINMENT WITH HIS HISTORIC DRUM. MSS 201, folder 1Free black men fought alongside regular U.S. troops, volunteers, and militia at New Orleans. Among the most famous of these was Jordan Noble. Though the inscription on this photograph associates him with Major Louis D’Aquin’s Battalion of Saint Domingue Free Men of Color, Noble actually served as a drummer boy for the 7th U.S. Infantry. Noble went on to fight in the Mexican War and the Civil War and played his drum at parades and civic events until his death in the late 1880s.